Add a surcharge or discount based on product type – for example, add an item handling or packaging charge to particular products (where you do not want to apply a global surcharge or discount). The surcharge can be applied on a per order, per product or per item level. When set to Yes, a product surcharge will be enabled. Choose your preferred surcharge type. If you select “per order” and have set up multiple product surcharges, then only the highest surcharge will be applied. Enter the surcharge description that will be visible to the customer – eg. “Secure Packaging Fee - Breakable Item”. 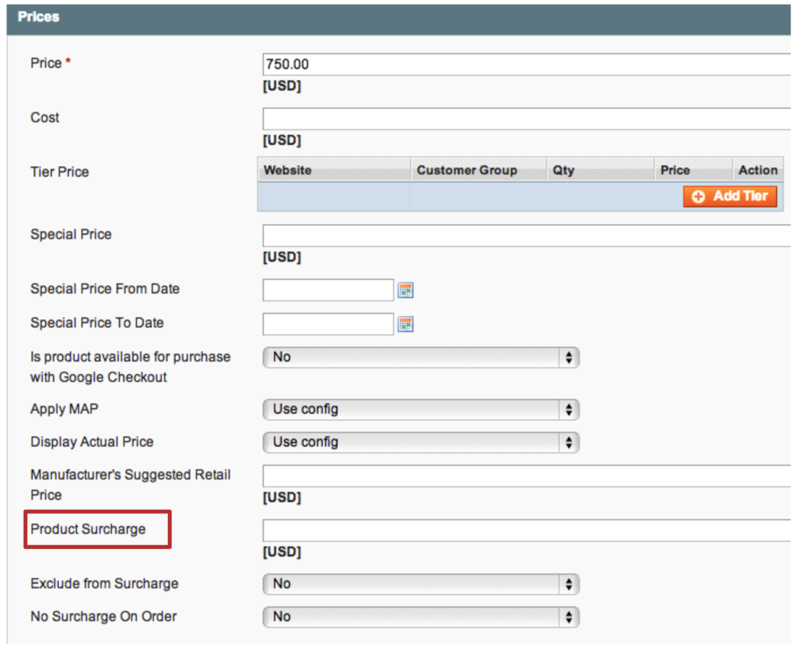 You also need to configure the surcharge individually for each product you wish to apply the surcharge to. Go to Catalog > Manage Products, and within the individual product select Prices. Enter the surcharge you wish to charge - eg. 50 (remember not to add any currency symbols). Only a fixed price surcharge is possible. Note: The Exclude from Surcharge and No Surcharge On Order settings (both v3.0.10+) allow you to exclude individual products from having surcharges applied. Refer to All Surcharge Settings for details.